"A many-splendored thing? 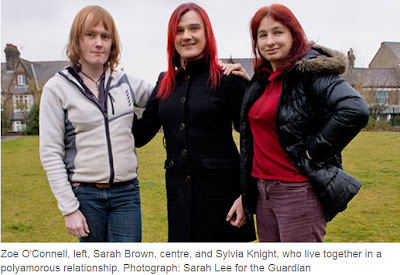 The polyamorous family"
An international British newspaper profiles, in its Life & Style / Family section, a happy and outgoing MtF-MtF-F equilateral triad. Their university town readily accepts them, one of the trans women is a city councilor, and the other hopes to run for Parliament. Brits have a reputation for loving their eccentrics if they're eccentric enough; could that be it? When Sylvia's husband said he wanted to become a woman, she stayed with him. But then Zoe, formerly a married man, joined the relationship. Like many students, the shy boy who studied computer science got drunk in the college bar with a girl from the year below. They snogged and — sharing a love of photography, computers and cups of tea — fell in love. Six years later, they married. A few years on, however, and this everyday story turned in an unexpected direction when the young man's hair began to thin. The young man became Sarah, now a chatty, self-assured city councillor who lives in Cambridge [UK]. A stereotypical way of describing trans women in childhood is to say they feel like "a girl trapped in a boy's body," says Sarah, but she believes few people think at that level. "As a kid, I assumed that everybody wanted to be a girl and some people were lucky enough to be born that way. Then it very rapidly became clear that this was something that we did not talk about...."
After Sarah's surgery, it was not simply a case of Sylvia loving the person she had always loved. Like any big life change, transition affected Sarah's personality. "Before she transitioned to female, she was really quiet and nerdy and I was doing the talking for two," says Sylvia. As a woman, Sarah is now forthright and confident. "It's amazing how people blossom and evolve when their relationships change," says Sylvia of Sarah. "There was something really nice that was brought out when she transitioned." ...The transformation of their relationship did not end there, however. When Sarah was transitioning, she struck up conversation online with Zoe O'Connell, a computer network manager who is also in the Territorial Army. Zoe was seeking a good place for laser hair removal in East Anglia and Sarah was able to recommend one, so they met for a cup of tea. Bonding over their shared experience of transition, they became good friends. While Sarah's path to gender reassignment surgery had been gradual, Zoe had a lightbulb moment. Like Sarah, she had entered into a heterosexual marriage; unlike Sarah, Zoe had three children with her wife. And it was not until the marriage broke down eight years ago that she began to question her gender. ...When Sarah had surgery at a hospital in Brighton, Zoe accompanied Sylvia and they fretted in a pub. Zoe spent a period "part-time" before going "full-time" four months after Sarah. "It got ridiculous," remembers Zoe. "At one point I ended up flip-flopping between boy-mode and girl-mode seven times in a day." Zoe was treated at the same hospital as Sarah. Some months later, Sarah and Zoe went to Brighton again to support a mutual friend's surgery and this time shared a twin-bedded hotel room. "There was sexual tension in the room," remembers Sarah, laughing. Sarah and Zoe were falling in love. Feeling increasingly stressed about their feelings, Sarah, Zoe and Sylvia sat down to talk and, together, they "renegotiated the bounds of the existing relationship," as Sarah puts it. Soon afterwards, Zoe moved into Sarah and Sylvia's house. At first, they tried sleeping together in a big bed but the person in the middle was always very uncomfortable. Now Zoe has her own room and often sleeps there, although the three all move between bedrooms. ...The striking thing when I meet Sylvia, Sarah and Zoe at their home is the absence of strain: their unconventional domestic arrangements — they also have five snakes — soon seem completely normal, perhaps because they are all so at ease with each other. "A lot of people looking at this from the outside would probably see you as the long-suffering wife," says Sarah to Sylvia. ...Isn't three fundamentally an awkward number? "It can be really handy," says Sylvia. "If two of us are massively disagreeing about whether to do something around the house, we can have someone to break the deadlock. As long as you're careful enough so it doesn't end up with two people picking on one." "We're all adult enough not to do that," adds Sarah. Living in Cambridge, they rarely experience discrimination or abuse. Sarah is not the city's first openly trans councillor, and when they pop down to their local real-ale pub: "No one bats an eyelid. We're probably some of the less 'out there' people," says Zoe. All three women feel liberated by their different experiences of transition and they know quite a few trans people now living polyamorous lives. "Gender transition is one of the most sexually taboo things you can do, and you do it and you realise the world doesn't end. Then you start thinking, what other things have I always taken for granted that are just wrong?" says Sarah. "In some ways I resent being born trans because it's been a lot of pain, a lot of hassle, and it has dominated my life. But at other times I almost feel grateful because it has given me an attitude that almost nothing is sacred and I don't have to be a prisoner to this very English 'mustn't make a fuss, mustn't challenge things' life of quiet desperation." Read the whole article (April 19, 2013). The article says they're a V.
No, the article says they're a triad, and that they feel a V would have been more complicated. I am sure I have met Zoe somewhere..... she looks awfully familiar.